Railway authorities say they are investigating the accident, which happened in Yilan County at about 16:50 local time (08:50 GMT) on Sunday. Taiwan's Central News Agency reports that dozens may still be trapped. The Puyuma Express 6432 service reportedly came off the tracks close to Xinma station, near the town of Su'ao about 70km (43 miles) from Taipei. 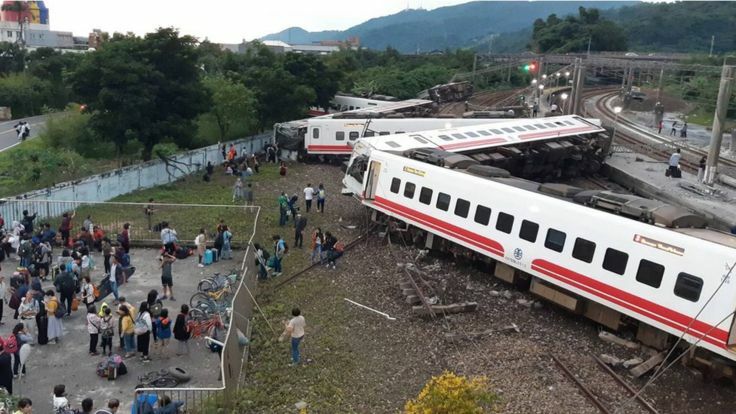 The deputy chief of the Taiwan Railways Administration, Lu Chieh-shen, told a news conference on Sunday that the train was only six years old and had been in "pretty good condition" before the accident. An AFP news agency reporter at the scene said more bodies were being removed from the damaged carriages at about 20:00 local time (12:00 GMT) on Sunday night. Reports say one of the dead is an American citizen. Photographs from the scene show seats upended, with parts of the railway tracks twisted through carriage windows in places. Taiwan's leader, Tsai Ing-wen, described the accident as a "major tragedy" on Twitter. Taiwan has an extensive train network and more than half a million passengers travel on the system every day.